It's time to ignite your passion and create the balance you deserve! 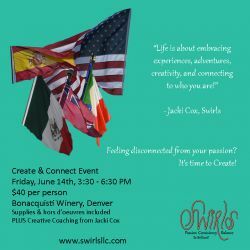 There will be a creative coaching session by founder of Swirls, Jacki Cox. Join us for a fun afternoon/evening of creative training for you to feel inspired, motivated and excited for what's to come in 2019. Come for a bit of networking, creative coaching from Jacki Cox, and TIME to think creatively. In celebration of Flag Day, we're going to be creating our own personal flags to show who you are! Wine purchases on your own.